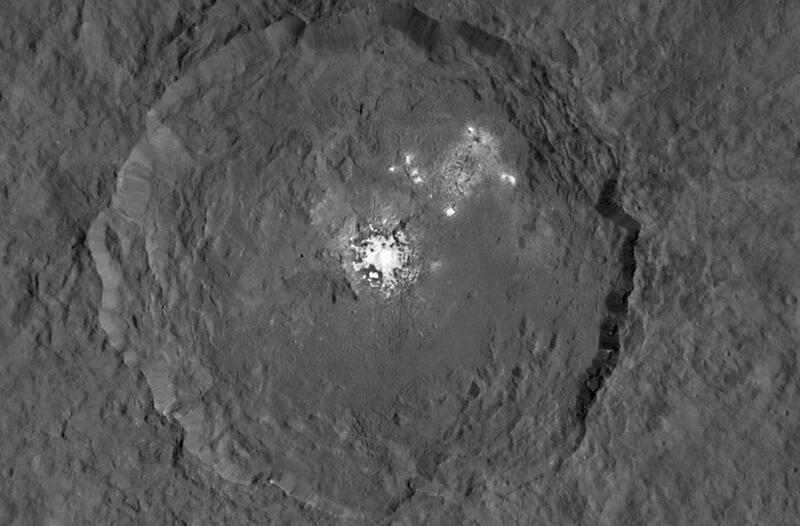 US space agency NASA’s Dawn spacecraft has captured bright, gleaming spots on the dwarf planet, Ceres. The close-up pictures of Occator, an impact crater (a circular depression) located on Ceres, reveal a collection of mysterious bright spots inside it. Occator is about 90 kilometres across and four kilometres deep. The new view of Occator shows the bright central spot and features on the crater floor in fine detail. As these spots are brighter than the rest of Ceres’ surface, scientists have combined two different images into a single composite view—one for the bright spots and another for the surrounding surface. A highly reflective material is responsible for these spots. Ice and salt are the leading possibilities, but scientists are considering other options also. “Everyone is intrigued and everyone has a theory (about the bright spots). Obviously ice will come to mind, but they can be cold geysers, salt deposits and what not. What is more mysterious about these white spots in Occator crater is that at times they sublimate and a haze is also seen," TV Venkateswaran, scientist Vigyan Prasar, told Down To Earth. The spacecraft has completed two 11-day cycles of mapping the surface of Ceres from its current altitude and began the third on September 9. Dawn will map the entire Ceres six times over the next two months. It is the first spacecraft to visit a dwarf planet. It arrived at Ceres, the largest object in the main asteroid belt between Mars and Jupiter, on March 6, 2015. The spacecraft, which for the first time orbits two celestial objects, earlier Vesta and now Ceres, uses the futuristic ion propulsion system. These ion engines can radicalise the inter-planetary travel in the future. Both Ceres and Vesta, a proto-planet (a terrestrial planet formed by fusion) earlier explored by Dawn, are perhaps the only remains from the time of the formation of the solar system 4.6 billion years ago in the terrestrial planetary region. “Studying them in detail will provide a much clearer picture of the formation of the solar system,” Venkateswaran said. The International Astronomical Union had earlier decided that names from all cultures around the world would be chosen, reflecting the international character of modern science. "We see that the third largest crater on the surface of Ceres has been named Urvara, after an Indo-Iranian deity symbolising fertility," Venkateswaran added.